Seal - duplicatura visceral peritoneum, formed by loose connective tissue and is rich in blood vessels and adipose tissue. 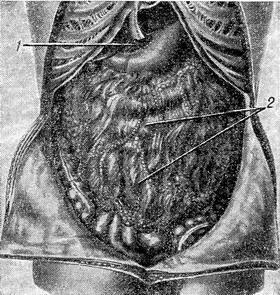 The greater omentum develops from the folds of the peritoneum, hanging from the greater curvature of the stomach, small seal formed hepatic gastric and hepatic duodenal ligaments, which is the locking device stomach and duodenal ulcers (Fig). The greater omentum covers the front of the intestinal loops, its principal function is a protective reaction with injuries and inflammatory diseases of the abdominal cavity. Due to a rich blood supply and a large number of loose connective tissue greater omentum quickly involved in the inflammatory process in injuries and acute inflammatory diseases of the abdominal cavity (with wound ulcer, acute appendicitis and others). As a result, the seal "soldered" to the affected organ, forms of the inflammatory infiltrate, which dissociates the inflammatory process, prevents the development of diffuse peritonitis (see). At these properties of the packing founded use it to shelter seam lines when suturing of perforated ulcer and at imposing anastomoses hollow organs, with the closure of gaps in the liver, etc. Rich blood to the greater omentum and fast its involvement in the inflammatory process allows you to use a large gland in surgical treatment of portal hypertension (cirrhosis), accompanied by ascites. Bred in the retroperitoneal space in the area of the kidneys, and the caul quickly spaevaet with other bodies of the newly formed vessels create an outflow of venous blood from the veins of the packing and related portal vein. This leads to a decrease of venous pressure in the portal vein and as a result to the reduction or disappearance of ascites. Acute inflammation of the greater omentum (epiploic) may occur due to infections (often secondary), torsion or injury. Epiploic may be accompanied by a pattern of acute abdomen (see), in these cases it is urgent surgical treatment. Damage of the packing with penetrating wounds of the abdomen may be accompanied by bleeding into the abdomen and also require emergency surgery. Benign tumors of the seal (lipoma, fibroma) are rare. Much more often the gland is affected by cancer metastasis, most often metastasize to the greater omentum stomach cancer and ovarian cancer.